Deep Penetrating Light (DPL) II Professional light therapy devise means you can rejuvenate your skin in the comfort of your home, whenever you want. No more expensive appointment necessary. No more traveling to the salon or doctor's office to get your skin rejuvenating treatments. The new DPL II Panel Anti-Aging Light Therapy System is so advanced that you can treat your face, neck, chest, hands and back in only minutes a day. The anti-aging effect caused by the deep penetrating DPL II lights include wrinkle and line reduction and prevention, skin tone and color enhancement, hyperpigmentation treatment and many other skin ailments. The results are healthy, glowing, youthful skin. In addition to anti-aging effects, the powerful infrared (IR) LED lights support skin healing and recovery activity, as well as minimizing damage caused by sunburn, bruising, cuts and scrapes, scarring, etc. 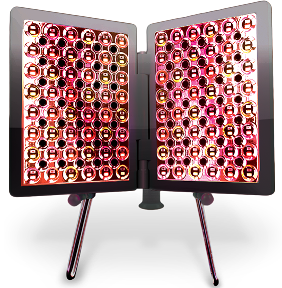 The DPL II system is the only full face professional light therapy device that is FDA-cleared for in-home use. And it is classified as an OTC Class II medical device for wrinkle reduction. Amber light helps to bring vitality to dull and lifeless complexions. Amber light is great for bringing a glow to the skin for special occasions and reduces the appearance of redness, swelling and inflammation. This color of light is beneficial for rosacea and the treatment of burns such as sunburns. Red light has the ability to reach deep layers of the skin, where it rejuvenates and stimulates cellular repair and increases circulation to promote a more vibrant and youthful complexion. Infrared (IR) light, invisible to the naked eye, penetrates deeper than any other color in the spectrum. IR light combats the signs of aging, replenishes dermal and epidermal cells, and stimulates the natural production of collagen and elastin. It is also used to de-age the skin and accelerate the healing of wounds, cuts and skin damage. Red and IR light work synergistically to deliver optimal skin rejuvenation.